B cells spontaneously process their endogenous Ig and present V region peptides on their MHC class II molecules. We have here investigated whether B cells collaborate with V region-specific CD4+ T cells in vivo. By use of paired Ig L chain-transgenic and TCR-transgenic mice and cell transfer into normal hosts, we demonstrate that B cell presentation of a VL region peptide to CD4+ T cells results in germinal centers, plasma cells, and Ab secretion. Because the transgenic B cells have a fixed L chain but polyclonal H chains, their B cell receptor (BCR) repertoire is diverse and may bind a multitude of ligands. In a hapten-based system, BCR ligation concomitant with V region-driven T-B collaboration induced germinal center formation and an IgM → IgG isotype switch. In the absence of BCR ligation, mainly IgM was produced. Consistent with this, prolonged V region-driven T-B collaboration resulted in high titers of IgG autoantibodies against ubiquitous self-Ags, while natural-type Abs against exotic bacteria remained IgM. Taken together, V region-driven T-B collaboration may explain induction of natural IgM Abs (absence of BCR ligation) and IgG autoantibodies (BCR ligation by autoantigen) and may be involved in the development of autoimmunity. We (1, 2, 3) and others (4) have previously shown that B lymphoma cells (1, 2), B cells from Ig L chain-transgenic mice (3, 5) and normal B cells (5) spontaneously display endogenous V region peptides (Id peptides) on their MHC class II molecules and activate Id-specific T cells. Supporting biochemical evidence was obtained in studies where peptides from Ig V or C regions were eluted from class II molecules of EBV-transformed B cells or B lymphoma cells (6, 7, 8, 9). MHC class II-presented Id peptides have been shown to derive from Ag processing of newly synthesized intracellular Ig (1, 2) as well as from endocytosed Ig (1, 10). Spontaneous B cell presentation of Id peptides on class II molecules should be of no consequence if T cells were tolerant. However, although T cells may be tolerant to abundant germline-encoded V region sequences (10, 11) in part due to deletion in the thymus (12), T cells have been shown to respond to rare sequences that depend upon somatic mutations (10, 11, 13) or possibly N region diversity. These studies suggest that low-frequency B cells expressing uncommon V region sequences could haphazardly encounter Id-specific T cells in peripheral lymphoid tissues, resulting in Id-driven T-B interaction (3, 4, 14, 15). This article addresses this issue, particularly in terms of B cell activation and secretion of natural Abs and autoantibodies. In conventional collaboration, T and B cells recognize antigenic determinants linked on the same molecule (16, 17). By contrast, Id-driven T-B collaboration is nonlinked because while T cells recognize Id/class II on the B cell surface, the B cells should recognize either no Ag or an Ag not linked to Id (Fig. 1⇓). The absence or presence of B cell receptor (BCR) 3 ligation in nonlinked Id-driven T-B collaboration is not a trivial distinction since BCR ligation has been described to have a multitude of consequences like up-regulation of Ag processing, costimulation, and arrest in periarteriolar lymphatic sheath for interaction with T cells (18, 19, 20, 21). We here hypothesize that in the absence of BCR ligation, Id-specific T cells should help B cells with any specificity, even for Ags not present in the body. Moreover, lack of BCR ligation might deprive the B cell for signals required for isotype switch, resulting in B cells secreting IgM “natural” Abs. We further hypothesize that in the presence of BCR ligation by available autoantigens, Id-driven T-B collaboration might result in switched IgG autoantibodies (Fig. 1⇓). Conventional T-B collaboration and nonlinked Id-driven T-B collaboration. A, Conventional T-B collaboration. B cells bind Ag with their BCR, internalize, and process it and present antigenic peptide fragments on MHC class II to T cells. Because the antigenic determinants recognized by the BCR and TCR originally reside on the same molecule, this is called linked recognition (13 ,14 ). B, Nonlinked Id-driven T-B collaboration. B cells process their endogenous Ig and present V region peptides (Id peptides) on their MHC class II molecules. Id-specific T cells that recognize Id peptide/MHC class II on B cells become activated and help Id+ B cells to differentiate into plasma cells. In this case, the BCR does not bind an Ag related to Id; therefore, T-B collaboration is nonlinked. Nonlinked Id-driven T-B collaboration may be subdivided into two situations: 1) the BCR binds no Ag or 2) the BCR binds an unknown (auto) Ag “X.” We hypothesize that the outcome could differ in these two cases: in the absence of BCR ligation, Id-driven T-B collaboration could result in IgM natural Abs. In the presence of BCR ligation by autoantigen, as depicted, isotype-switched IgG Abs could be produced. Although this figure for reasons of simplicity depicts binding of monovalent Ag to BCR, the present experiments were done under conditions where multivalent Ag could have cross-linked BCR. It is difficult to study Id-driven T-B cooperation in normal animals because of the rarity of potentially matching T and B cell pairs and the difficulty of tracking such low-frequency events. Using paired Ig and TCR-transgenic mice and dilution of collaborating transgenic B and T cells into normal recipients, we report experiments designed to test the hypothesis put forward above and in Fig. 1⇑. More specifically, we use mice that are transgenic for a λ2 Ig L chain gene derived from the MOPC 315 plasmacytoma (22); this λ2315 L chain expresses a rare non-germline 91-101 CDR3 idiotope that is presented on a MHC class II molecule (I-Ed) to CD4+ cells (10). Because these mice (called Id+ mice) are only transgenic for the λ2315 L chain, their B cells express a polyclonal H chain repertoire endowing them with diverse BCR specificities. The other strain is transgenic for an αβ TCR that is specific for the Id(λ2315)-I-Ed complex (23); these mice are called Id-specific TCR-transgenic mice. The hemizygous λ2315 Ig L chain-transgenic mice (Id+-mice) (22) and the hemizygous αβ TCR-transgenic mice specific for the Id(λ2315) peptide presented on I-Ed (23) are both on a BALB/c background (>20 backcrosses). Offspring from BALB/c × hemizygous transgenic mice were used; the transgene-negative littermates serving as negative controls. TCR-transgenic SCID mice were on a C.B-17 scid/scid background (24). BALB/c, C.B-17, C.B-17 SCID, and BALB/c RAG2−/− mice were from M+B (Ry, Denmark). OVA-specific DO.11.10-transgenic mice (25) were purchased from Jax Mice (Bar Harbor, ME). ELISAs have previously been described (22) for measurement of Ig with either λ2 or λ3 (wλ2/3) L chains; IgM w/λ1, λ2/3, or κ; IgG1 w/λ1, λ2/3, or κ; IgG2a w/λ1, λ2/3, or κ; IgG2b w/λ1, λ2/3, or κ; IgA w/λ1, λ2/3, or κ. Since expression of endogenous λ1, λ2, and λ3 L chain is negligible in λ2315-transgenic mice (22), the Vλ1/2 (9A8 mAb and λ2/λ3 (2B6 mAb)-based ELISAs measure almost exclusively transgene-encoded λ2315Ig in these mice, i.e., Id+ Ig. Id+ IgMa, or Id+ IgG1a was detected by catching with anti-IgMa or anti-IgG1a (BD PharMingen, San Diego, CA) and probing with biotinylated (bio) 9A8 mAb. All ELISAs, except those mentioned below, were blocked with PBS with 1% BSA. Bacterial lysates (provided by Dr. K. Rese, Institute of Immunology, Oslo, Norway) from Salmonella infantitis, Shigella flexneri, Klebsiella pneumoniae, Yersinia enterocolitica, Helicobacter pylori, Campylobacter jejuni, Borrelia afzelii, Borrelia garinii, and Borrelia burgdorferi sensu stricto were used at 5 μg/ml to coat ELISA wells. Bacterial-specific Abs were detected with bio-rat anti-IgM (R6-60.2) or bio-anti-IgG1 (A85-1; BD PharMingen). Rheumatoid factor ELISA: Wells were coated with various mouse IgG: IgG1 (TIB96; American Type Culture Collection, Manassas, VA), IgG2a (EO-1, provided by Dr. S. Funderud, Department of Immunology, Norwegian Radium Hospital, Oslo, Norway), IgG2b (RG7/9.1, TIB169; American Type Culture Collection), and IgG3 (K9316, provided by Dr. J. Klein, Tübringen, Germany). Diluted supernatant (SN) or serum was added. IgM anti-IgG rheumatoid factor was detected with bio-anti-IgMa (BD PharMingen). For autoantibody ELISA, wells were coated with recombinant human La, RO52, or RO60 (kindly provided by K. A. Brokstad, Department of Microbiology and Immunology, Gade Institute, University of Bergen, Bergen, Norway), purified human proteinase 3 (Wieslab, Sweden), bovine thyreoglobulin, calf thymus dsDNA and ssDNA, and histone IIA (Sigma-Aldrich, St. Louis, MO). Bio-anti-IgMa (DS-1), bio-anti-IgG1a (10.9), bio-anti-IgG2aa (8.3), bio-rat anti-mouse IgG1 (A85-1), bio-rat anti-mouse bio-anti-IgG2a (R19-15) were obtained from BD PharMingen. For anti-NIP ELISA, plates were coated with NIP-BSA or NIP-OVA, were blocked by PBS w/1% BSA or 3% skimmed milk powder, serum dilutions were added, and anti-NIP Ab were detected by the above Ig isotype or allotype-specific bio-mAbs. Id+ Ig anti-NIP Ab was measured by use of bio-9A8 (anti-Vλ1/2 (22)) or bio-2B6 (anti-Cλ2/3 (22)). κ+ anti-NIP was detected by bio-187.1 mAb (HB58; American Type Culture Collection). Sera were compared with a defined standard of affinity-purified anti-NIP Ig from NIP-keyhole limpet hemocyanin (KLH) hyperimmunized Id+ mice. In ELISAs using sera from mice repetitiously injected with Th2 cells, serum Abs reacted to the blocking solution (1% BSA) and some other proteins tested. This reactivity was removed by using purified chicken IgG 0.1% (Sigma-Aldrich) in PBS as block. The following mAbs were affinity purified and biotinylated or FITC conjugated in our laboratory: transgenic TCR-clonotype-specific GB113 (26), anti-CD4 (GK1.5,), anti-CD8, (53.6–7.2), anti-Thy 1.2, (T24), anti-DEC205 (NLDC145), anti-CD11c (HB-224), 33D1 (TIB227), anti-CD11b (TIB198), anti-F4/80 (HB198), anti-MHC class II (TIB120), 9A8 (anti-Vλ1/2), 2B6 (anti-Cλ2/3), anti-μ (Bet 2) and anti-κ (187.1). FITC-anti-CD4 (RM4-5), PE-anti-CD4, allophycocyanin-anti-CD4, PE-anti-CD69 (H1.2F3), PE-anti-CD45R/B220 (RA3-6B2), allophycocyanin-anti-CD45R/B220, PE-anti-CD19 (1D3), bio-anti-CD19, PE-anti-CD11b (M1/70), allophycocyanin-anti-CD11b, bio-anti-IgMa (DS-1), PE-anti-IgMa, bio-anti-IgG1a (10.9), bio-rat anti-mouse IgG1 (A85-1), bio-anti-IgG2aa (8.3), bio-anti-IgG2a (R11-89), bio-anti-IgG2b (R12-3), bio-anti-IgG3 (R40-82), streptavidin-CyChrome, and streptavidin-PerCP were all purchased from BD PharMingen. Anti-5-bromo2′-deoxyuridine (BrdU)-FITC was obtained from BD Biosciences (San Jose CA). Fluorescein-peanut agglutinin (PNA) was purchased from Vector Laboratories (Burlingame, CA). Samples were preincubated with 30% heat-aggregated rat serum in Dulbecco’s PBS on ice for 20 min before stainings. Quadruple stainings were performed with FITC-, PE-, PerCP-, and allophycocyanin- conjugated mAbs and acquired on FACSCalibur or FACSVantage (BD Biosciences) and files were analyzed with WinMDI 2.7. Stainings of lymph node (LN) and spleen sections were performed by embedding organs in OCT; 5-μm frozen sections were mounted on l-polylysine-coated glass slides, air-dried overnight, blocked with 30% heat-aggregated rat serum, and stained with biotinylated or FITC-conjugated mAbs (see above), Alexa Fluor 488 and 546 goat anti-IgG (highly cross-absorbed), Alexa Fluor 488 goat anti-mouse-γ2a and Alexa Fluor 546 goat anti-mouse-γ1 (Molecular Probes, Eugene, OR), streptavidin-Cy2 and 3 (Amersham, Pittsburgh, PA), and 4′,6′-diamino-2-phenylindole dihydrochloride (Molecular Probes). Diluted sera were added to HEp2 cells (Immunoconcepts, Sacramento, CA) or to monkey kidneys and esophagus sections (The Binding Site, Birmingham, U.K.): bound Abs were detected with FITC-anti-IgM (II/41; BD PharMingen), Alexa Fluor 488 goat anti IgG2a and Alexa Fluor 546 goat anti IgG1 (Molecular Probes). Photographs were made with a charge-coupled device camera (Hamamatsu, Ichinocho, Japan). NIP (4-Hydroxy-3-iodo-5-nitrophenyl acetyl)-fluorescein-BSA, NIP-fluorescein-aminoethyl carboxymethyl (AECM)-Ficoll, and 2,4,6-trinitrophenyl (TNP)-fluorescein-AECM-Ficoll were obtained from Biosearch Technologies (Novato, CA). Fluorescein-PNA and rhodamine-PNA were from purchased Vector Laboratories. The Id-specific BALB/c Th1 clone, 4B2A1, the donor of the TCR transgenes, has been described elsewhere (10). A panel of Th1 and Th2 clones were derived from Id-specific TCR-transgenic mice (24). For generation of short-term cultured polarized Th1 and Th2 cell lines, TCR-transgenic LN cells were stimulated with Id peptide and irradiated BALB/c splenocytes in the presence of defined lymphokines (3), restimulated on day 10, and used on day 20. Such cells, referred to as Th1 and Th2 cells, were >99% CD4+ cells (3). Negative selection of B cells was done by flow cytometric sorting of B cells on a FACSVantage as described previously (3) by sterile double stainings of spleens with 1) anti-CD11c-FITC (HL3; BD PharMingen) and 2) a biotinylated mix of eight mAbs with a broad non-B cell specificity. The combined eight biotinylated mAbs were detected with streptavidin-CyChrome (BD PharMingen). Small B cells were sorted as double-negative cells within a tight lymphocyte forward scatter-side scatter gate. B cell purity and appropriateness of the gates were tested as described elsewhere (3). Proliferation of B cells in T-B cooperation experiments was measured by culturing B cells with irradiated T cells (1000 rad), with a [3H]TdR overnight pulse from days 3 to 4. Ab secretion was assayed by culturing splenic B cells (5 × 105/ml) in the presence or absence of T cells (1 × 105/ml) for the indicated number of days. SN were removed and Ig concentrations were measured by ELISA. Using ELISPOT, MultiScreen-HA plates (Millipore, Bedford, MA) were coated with anti-Vλ1/2 (9A8 (22)) or EO-1 (mouse IgG2aa) spleen cells were added for 4–6 h, plates were washed, incubated with bio-anti-Cλ2/3 (2B6), bio-rat anti-IgG1a (A85-1), and bio-anti-IgMa (BD PharMingen), washed, streptavidin-polymer alkaline phosphatase (Sigma-Aldrich) was added, washed, and finally a Bio-Rad alkaline phosphatase substrate kit (Bio-Rad, Hercules, CA) was applied according to the manufacturer’s instructions. T or B cells, thrice washed, and resuspended in protein-free RPMI 1640 were filtered through a sterile nylon sheet (40-μm mesh) and injected in a volume of 0.15 ml into Id+, Id−, SCID, or C.B-17 mice tail veins as indicated. On the day following the last injection of lymphocytes, BrdU was provided as an i.p. injection (1 mg) and continuously in the drinking water (1 mg/ml) in some experiments (3). Blood, LN, and spleens were harvested as described previously (3). NIP was coupled to BSA, KLH, or OVA carriers in our laboratory or purchased from Biosearch Technologies. The following conjugates were used: (NIP)6-KLH (i.e., 6 NIP molecules per 1 × 105 molecular mass of KLH), (NIP)5-BSA, and (NIP)9-OVA (i.e., each BSA and OVA molecule was on average coupled with ≈5 and ≈9 NIP molecules, respectively). Id+ or Id− mice were i.p. injected with 200 μg NIP carrier in CFA and spleens were harvested after 5–8 wk. In some experiments, T cells were depleted from splenocytes with anti-CD4-, anti-CD8-, and anti-Thy.1-coated Dynabeads (Oslo, Norway). Spleen cells were injected i.v. into unirradiated recipients (RAG2−/− BALB/c or C.B-17) followed the next day by i.v. injections of Th2 cells and i.p. injections of NIP carrier diluted in PBS. Sera of reconstituted mice obtained at the indicated days posttransfer were assayed in ELISA for total Id+ Ig anti-NIP or anti-NIP with κ L chains. Furthermore, anti-NIP Abs with different H chain isotypes and allotypes were determined as described above. In the absence of any added Ag, purified small resting Id+ B cells proliferated in vitro in response to Id-specific Th1 and Th2 cell lines and were helped to secrete Id+ IgM and IgG. Responses were dependent upon presentation of Id because Id-specific T cells did not help Id− B cells. Responses were dependent on Id specificity of T cells because OVA-specific DO11.10-specific T cells did not help Id+ B cells (Fig. 2⇓, A and B, and data not shown). Id+ B cells become activated, proliferate, and secrete Id+ Ig in the presence of Id-specific T cells. A, Proliferation of sorted B cells in vitro. Titered amounts of 1000-rad irradiated, cultured Id-specific Th1 (▪, □) or Th2 (▴, ▵) cells were added to negatively sorted ex vivo Id+ (▪, ▴) or Id− (□, ▵) B cells (105/well). B cell proliferation was measured by a [3H]TdR pulse between days 3 and 4. B, IgG secretion of sorted B cells in vitro. Nonirradiated Th1 and Th2 cells (or no T cells) were cultured with Id+ (□) or Id− (▪) sorted B cells for 12 days. Id+ IgG isotypes in SN are shown. C, Activation of Id+ B cells in vivo. Id-specific T cells (5 × 106) were injected i.v. into Id+ or Id− mice. Eleven days later, mice were killed and splenocytes were stained. Forward scatter vs CD69 staining of gated B cells is shown. D, BrdU incorporation into Id+ B cells (detected by the λ2/3-specific 2B6 mAb) in Id+ mice that either had (top) or had not (bottom) received Id-specific Th2 (3 × 106) cells 6 days previously. E, Sera from Id+ mice injected with Th1 or Th2 cells (5 × 106) 11 days previously were analyzed for Id+ IgM, Id+ IgG1, and Id+ IgG2a. B, Before T cell injection; A, after injection. F, Splenocytes corresponding to 7.5 × 105 Id+ or Id− B cells were injected i.v. into unirradiated C.B-17 mice (IgHb) followed by Id-specific Th1 or Th2 cells (3 × 106), or no T cells, the next day. Shown is serum Id+ IgMa and Id+ IgG1a on day 13, originating from transferred IgHa cells. We next investigated whether Id+ B cells could be helped by Id-specific T cells in vivo. When Id+ mice were injected i.v. with Id-specific Th2 cells, their spleens more than doubled in size and had a striking increase in activated CD69+ B cell blasts that proliferated because they incorporated BrdU in vivo (Fig. 2⇑, C and D). (Note that also Id-specific T cells proliferated under these conditions, Fig. 2⇑D, lower right quadrant). B2 (CD5−) cells and B1 (CD5+) cells proliferated to a similar extent (data not shown). Such Id+ B cell activation was accompanied by marked increases in serum Id+ IgM and Id+ IgG (Fig. 2⇑E). Id+ B cell activation and differentiation was seen with either Th1 or Th2 cells (Fig. 2⇑, C–E). B cell responses were Id driven because no responses were seen when Id-specific Th1 or Th2 cell were transferred into Id− mice or when Id+ mice were injected with OVA-specific Th1 or Th2 lines (data not shown). These primary responses were dominated by IgM, but clear IgG responses were found (Fig. 2⇑). In these experiments, no deliberate BCR ligation was performed, but a multitude of Ags exist both in vitro (such as proteins in FCS) or in vivo (such as autoantigens and conventional non-self Ags) that could have served as BCR ligands. In another set of experiments, see below, the effect of BCR ligation was tested under controlled conditions. In the experiments described above, the plurality of B cells expressed the Id peptide and the injected Id-specific T cells apparently helped most B cells. To make the interaction more physiological, we investigated whether Id+ B cells and Id-specific T cells of lower frequencies would productively encounter in normal mice with intact lymphoid organs. C.B-17 mice (IgHb allotype) were injected with splenocytes from Id+ or Id−mice that have the IgHa allotype. This was followed the next day by reconstitution with Id-specific Th1 or Th2 cells. Two days after transfer, Id+ B cells and Id-specific T cells each represented ≈1% of spleen lymphocytes, as established by flow cytometry. Thirteen days later, splenic Id+ IgMa B cells had more than doubled in numbers and a major fraction expressed CD69; these changes occurred with cotransfer of either Th1 or Th2 cells (transferred T cells underwent a similar activation and expansion). Even more striking, serum Id+ IgMa and Id+ IgG1a greatly increased and more so with Th2 cells than with Th1 cells (Fig. 2⇑F). Id+ B cell activation required Id-specific T cells, and Id− B cells were not helped by Id-specific T cells (Fig. 2⇑F and data not shown). We therefore conclude that Id-driven T-B collaboration occurred when cells were diluted to low frequencies in normal recipients. To investigate differentiation pathways of Id+ B cells, Id+ mice or Id− control littermates were injected with Id-specific Th2 cells. Eleven days later, injected Id+mice had a pronounced increase in B220+PNAhighIgD− cells in their LN, half of which were CD38int/neg, consistent with mouse GC B cells (Fig. 3⇓A and data not shown). Similar findings were done for the spleen at a quantitative level, changes being more pronounced after two injections of Th2 cells (Fig. 3⇓B). Induction of GC B cells was Id driven because Id− mice injected with Id-specific Th2 cells had no increase in B220+PNAhigh cells (Fig. 3⇓B). Id-driven T-B collaboration generates GC. Th2 cells (3 × 106) were injected once (day 0) or twice (day 0, day 11) into Id+ and Id− mice and recipients were analyzed on day 11 (Th2×1) or day 18 (Th2×2). 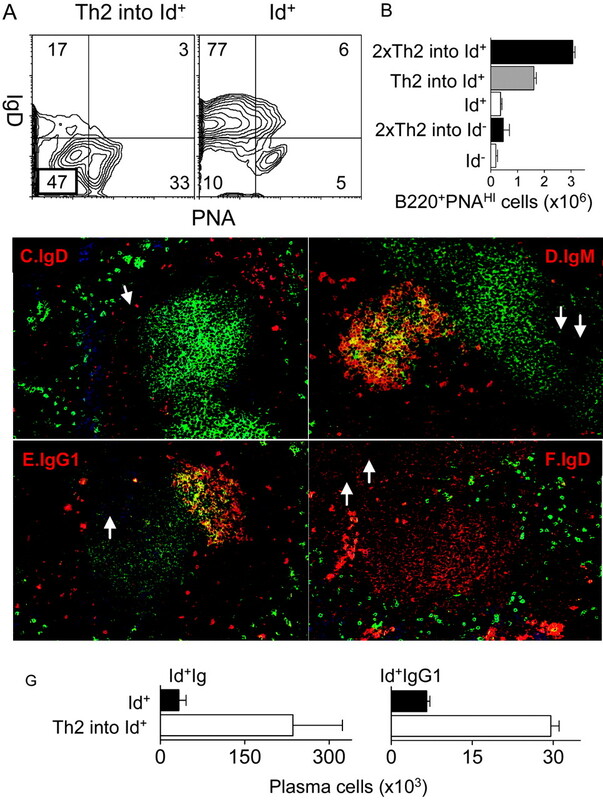 A, IgD and PNA staining of gated LN B cells (B220+) in Th2 × 1 injected and uninjected Id+ mice. B, Numbers of B220+PNAhigh spleen B cells in the differently treated Id+ and Id− recipients. C–F, Spleen sections were stained with FITC-conjugated PNA (green) and the indicated biotinylated anti-Ig isotype mAbs detected by streptavidin-Cy3 (red). Nuclei were stained with 4,6-diamino-2-phenylindole dihydrochloride (blue). Arrows indicate central arterioles. C–E, Sections from Id+ mouse injected with Th2 cells ×1. F, Section from uninjected Id+ mouse. G, Splenocytes from uninjected Id+ mice or Id+ mice injected with Th2 cells (day 11, Th2×1) were tested in a 6-h ELISPOT assay. Numbers of Id+ Ig-producing or Id+ IgG1-producing cells/spleen are shown. Consistent with the flow cytometry results described above, injected Id+ mice had large numbers of GC in spleen and LN. The central areas of GC were dominated by PNAhigh cells that had lost IgD, whereas IgM was maintained on a fraction of the cells (Fig. 3⇑, C and D). Th1 cells were also effective at inducing GC in Id+ mice but less so than Th2 cells. In uninjected Id+ mice, nearly all follicles were primary with PNA−IgM+IgD+ cells and few GC were seen (Fig. 3⇑F). As additional controls, injection of Id-specific Th2 cells did not influence the number of GC in Id−mice, nor did OVA-specific DO11.10 Th2 cells injected into Id+ mice (data not shown). In Id+ mice injected with Th2 cells, most splenic and LN B cells expressed IgM and only ∼1% expressed IgG1. Nevertheless, the absolute number of splenic B220+PNAhighIgG1+ B cells was 5-fold increased, compared with Id− littermates injected with Th2. Moreover, PNAhighIgG1+ follicles were increased in number, from 0.2 per cross-section in uninjected Id+ mice to 13 (±3) in Id+ mice injected with Th2 cells (Fig. 3⇑E and data not shown). Id+ mice injected with Th2 cells had a striking expansion of extrafollicular B cells (B220+PNAlowIgD−) in their LN (Fig. 3⇑A); the expansion in the spleen was even more pronounced. There was also a striking increase (×10) of CD138+ (Syndecan+) blasts, of which one-half were negative for MHC class II and approximately one-third had recently proliferated (BrdU+). Consistent with this, the reconstituted mice had an increase in splenic plasma cells that secreted Id+ Ig and Id+ IgG1 as detected by ELISPOT (Fig. 3⇑G). Such B cell differentiation into extrafollicular B cells and Ig-secreting plasma cells was not found in Id− mice injected with Th2 cells, nor in uninjected Id+ and Id− mice (Fig. 3⇑G and data not shown). Id+ mice have a fixed transgenic L chain, but polyclonal H chains and therefore a diverse repertoire. An important question is therefore: when T cells help B cells that present their endogenous Id, what is the influence of BCR ligation? To test this, we performed a number of adoptive cell transfer experiments in which T and B cells were injected i.v. into immunodeficient mice or diluted into normal C.B-17 mice to a relatively low frequency (∼1–2% of C.B-17 splenic lymphocytes were derived from the injected cells). To obtain NIP-primed B cells, Id+ and Id− mice were immunized i.p. with the NIP hapten conjugated to the carrier protein KLH ((NIP)6-KLH) in CFA. Splenocytes from immunized or nonimmunized mice were injected i.v. into RAG2−/− BALB/c or C.B-17 recipients (Table I⇓, Expt. A and B). Recipients received Id-specific Th2 cells i.v. 1 day later and were boosted or not boosted i.p. with the BCR ligand (NIP)5-BSA (i.e., each BSA molecule was on average coupled with ≈5 NIP molecules). Thus, the experiment was done under conditions that would allow cross-linking of BCR, and effect of monovalent binding of Ag to BCR was not tested. Note that the carrier protein KLH from the priming was switched to BSA during the boost to ensure that NIP-specific B cells did not receive carrier-specific effector T cell help. As a further safeguard, in experiment A, the splenocytes were depleted of T cells before transfer into RAG2−/− mice. The following conclusions can be made from experiments A and B in Table I⇑. First, detection of anti-NIP Abs in recipients was dependent on NIP-KLH immunization of the B cell donors (group (gr.) 1 vs gr. 3, both Expts. A and B, p < 0.05). Second, in recipients of NIP-KLH-primed Id+ B cells and Id-specific Th2 cells, anti-NIP Abs were Id+ (λ2315 chain+) and hardly any anti-NIP Abs with κ-chains were detected (data not shown). Third, inclusion of NIP-BSA boost in mice that had received NIP-specific Id+ B cells and Id-specific Th2 cells increased total Id+ Ig anti-NIP, although the increase was only significant (p < 0.05) in experiment A and not experiment B (gr. 1 vs gr. 2). Fourth, responses were Id driven since neither Id+ anti-NIP (Expt. B, gr. 1 vs gr. 4, p < 0.05) nor κ+ anti-NIP responses (data not shown) were obtained with transferal of NIP-KLH-primed B cells from Id− mice. The latter result also demonstrates that Id-specific Th2 cells did not unspecifically help (κ+ anti-NIP) B cells. Fifth, IgM anti-NIP responses were not significantly influenced by the presence or absence of boost, suggesting that BCR ligation is not required for IgM production by NIP-primed B cells helped by Id-specific Th2 cells (data not shown). Sixth and most important, Id+ anti-NIP of the IgG1 isotype significantly increased in the presence of a NIP-BSA boost (gr. 1 vs gr. 2, both Expts. A and B, p < 0.05). In fact, in the absence of NIP-BSA boost, only marginal amounts of IgG1 anti-NIP was produced. Thus, nonlinked Id-driven T-B collaboration required BCR ligation (NIP-conjugated protein) for B cells to isotype switch to IgG1. Consistent with Th2 cells being used in these experiments, BCR ligation did not increase Id+ IgG2a production (data not shown). We next compared conventional linked collaboration with nonlinked Id-driven T-B collaboration (Expt. C in Table I⇑). To this end NIP9-OVA was used as the boost Ag and OVA-specific Th2 cells were compared with Id-specific Th2 cells. It should first be noted that the presence of NIP-OVA greatly increased the ability of OVA-specific Th2 cells to help NIP-specific B cells, as would be expected from conventional linked recognition (gr.2 vs gr.3). Second, OVA-specific Th2 cells and Id-specific Th2 cells were equal in their ability to induce Id+ Ig anti-NIP. In contrast, OVA-specific Th2 cells induced more IgG1 anti-NIP Ab than Id-specific Th2 cells (gr. 1 vs gr. 2); however, the difference was not statistically significant. Thus, the efficacy of nonlinked Id-driven T cell help is comparable to that of carrier-specific T cell help. We next investigated whether nonlinked Id-driven T-B collaboration correlated with formation of GC. Spleens of C.B-17 recipients corresponding to groups 1, 2, 3, and 4 in experiment B of Table I⇑ were analyzed by immunohistochemistry 2 wk after adoptive cell transfer. Indeed, when NIP-specific Id+ B cells, NIP-BSA, and Id-specific T cells were present in normal C.B-17 recipients (gr. 1), NIP-binding cells were found in large GC (Fig. 4⇓A). Such NIP-binding PNAhigh B cells did not bind other fluorochrome-labeled control haptens like TNP-AECM-Ficoll or TNP-BSA (data not shown). Furthermore, NIP-specific GC formation was dependent on the presence of primed Id+ B cells (Fig. 4⇓, C and D) and required BCR ligation (NIP-BSA boost, Fig. 4⇓B). Thus, under conditions of nonlinked Id-driven T-B collaboration, BCR ligation was required for pronounced GC formation. This observation is consistent with a similar requirement of BCR ligation for detection of switched IgG1 anti-NIP Abs in serum (Table I⇑). Id+ B cells are helped by Id-specific (spec) T cells to undergo a GC reaction in the presence of BCR ligand. B cells (3 × 106) from NIP-KLH-immunized or nonimmunized mice were transferred into C.B-17 recipients, followed by Id-specific Th2 in the presence or absence of the BCR ligand (i.p. NIP-BSA boost) (corresponds to gr. 1–4 of Expt. B, Table I⇑). Spleens were harvested after 2 wk and stained with PNA-rhodamine (red, GC B cells) and NIP-AECM-Ficoll (green, NIP-specific B cells). A, C.B-17 recipients of NIP-primed Id+ B cells, Id-specific T cells, and NIP-BSA. 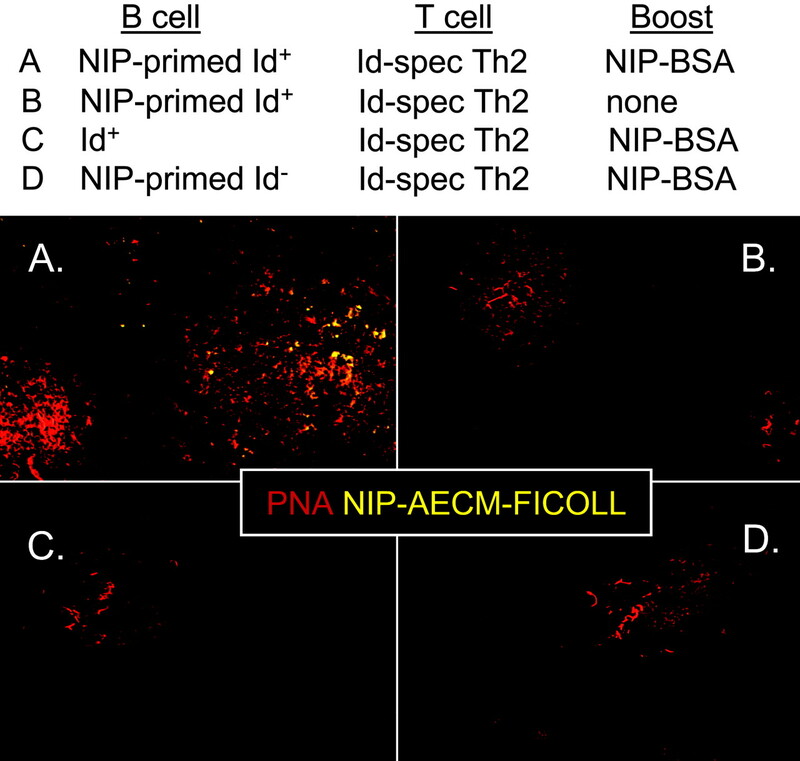 B, C.B-17 recipients of NIP-primed Id+ B cells, Id-specific Th2 cells but no NIP-BSA (gr. 2). C, C.B-17 recipients of nonimmunized Id+ B cells, Id-specific Th2 cells, and NIP-BSA (gr. 3). D, C.B-17 recipients of NIP-KLH-immunized Id− B cells, Id-specific T cells, and NIP-BSA (gr. 4). The experiments described above employed well-defined haptenated protein as BCR ligands in secondary B cell responses. We next extended these investigations to B cells that had not been deliberately primed with any Ag. In these studies, we took advantage of the fact that Id+ B cells express the λ2315 L chain paired with polyclonal endogenous H chains, and thus have diverse BCR specificities for Ags including self- and bacterial Ags (see Fig. 1⇑). Thus, ubiquitous self-Ags might ligate BCR under conditions of Id-driven T-B collaboration and promote GC reaction, isotype switch, and secretion of autoantibodies. Consistent with this, GC and isotype switching were seen in vivo with transfer of Id-specific T cells even in the absence of deliberate BCR Ag (see Fig. 3⇑). It is quite possible that autoantigens provided BCR ligands for these GC reactions. By contrast, when considering pathogenic and exotic bacterial Ags to which the mice have not been exposed, no ligands should be present in vivo and exclusively IgM Abs would be expected. Accordingly, we investigated specificities and isotypes of Ig responses resulting from Id-driven T-B collaboration, testing in particular for secretion of isotypes of antibacterial Abs and autoantibodies. A panel of lysates from seven Gram-negative pathogenic bacteria strains and three Borrelia spirochetae strains were used as Ags for Id+ Ig in ELISA (see Fig. 5⇓C, right, and Materials and Methods for a listing of the bacteria). These pathogenic bacteria should not be present and have not been detected in our animal housing facilities. In in vitro experiments, cocultures of Id+ B cells and Id-specific Th1 or Th2 cells (both of which were required) resulted in production of Id+ IgM anti-bacterial Abs (data not shown). Similarly, sera from Id+ mice injected once with Th1 or Th2 cells 11–13 days earlier had a striking increase in IgM Abs against all of the bacterial Ags. An example is shown in Fig. 6⇓A for IgM anti-Y. enterocolitica. Th2-injected Id− mice or uninjected Id+ mice had hardly any IgM antibacterial Abs (Fig. 6⇓A). Moreover, induction of IgM antibacterial Abs required Id specificity of T cells because injection of OVA-specific DO11.10 Th2 cells did not induce antibacterial IgM Abs. IgG antibacterial and autospecific Abs in Id+ mice injected repetitiously with T cells. Analysis of sera from Id+ mice injected repeatedly four to eight times every 10th day with Id-specific (spec) Th2 cells (•, n = 11) or DO.11.10 Th2 cells (○, n = 8). A, Levels of Id+ IgM and Id+ IgG in sera. B, OD values of IgG1-anti Y. entereocolitica (left) or IgG1 antirecombinant human La (right) in serum dilutions are shown. C, Titers of IgG1 Abs against a panel of autoantigens (left) and bacterial Ags (right) in sera from Id+ mice injected repeatedly with Id-specific Th2 cells. Titer was calculated as the dilution where sera from Id-specific Th2-injected mice remained clearly above the 95% confidence interval for control sera from DO.11.10 Th2-injected Id+ mice (negative controls). D, Detection of IgG autoantibodies in sera by indirect immunofluorescence. Example from Id+ mice repeatedly injected with Id-specific Th2 cells (right) or DO.11.10 Th2 cells (left). Top panel, IgG1 (Alexa 488, green) on Hep-2 cells; middle panel, IgG1 (Alexa 546, red) on monkey kidney; bottom panel, IgG1 (Alexa 546, red) on monkey esophagus. Antibacterial and autoreactive IgM Abs in Id+ mice injected once with Id-specific T cells. A, Sera from Id+ mice injected once with Th2 cells (n = 7, ▪) or from uninjected Id+ mice (□), or Id− mice injected once with Th2 cells (n = 5, ▴) were tested 11–13 days later for IgM Abs against a panel of bacterial Ags and autoantigens (see Materials and Methods and Fig. 5⇑C); IgM anti-Y. entereocolitica (left) and IgM anti-human (h) PR3 (right) are shown as examples. B, Sera from Id+ mice (left) or Id− mice (right) injected once with Th2 cells were tested for presence of IgM autoantibodies in indirect immunofluorescence on HEp-2 cells. Sera were diluted and detected by FITC-anti-IgM mAb. Left, Injected Id+ mouse (1/90 dilution); right, injected Id− mouse (1/30 dilution). Representative examples are shown. In the experiments described above, no IgG antibacterial Abs were found. We therefore investigated whether IgG antibacterial Ags would eventually develop if the observation period was extended. In preliminary experiments, we found that injected T cells disappeared from reconstituted Id+ mice after ≈ 3 wk, and no switch to IgG occurred. For that reason, recipient mice were repetitiously replenished with Id-specific Th2 cells injected every 10th day for four to eight times. Sera of mice that had received repeated injections of Id-specific Th2 had greatly increased levels of Id+ IgG1, but only moderately increased Id+ IgM (Fig. 5⇑A). 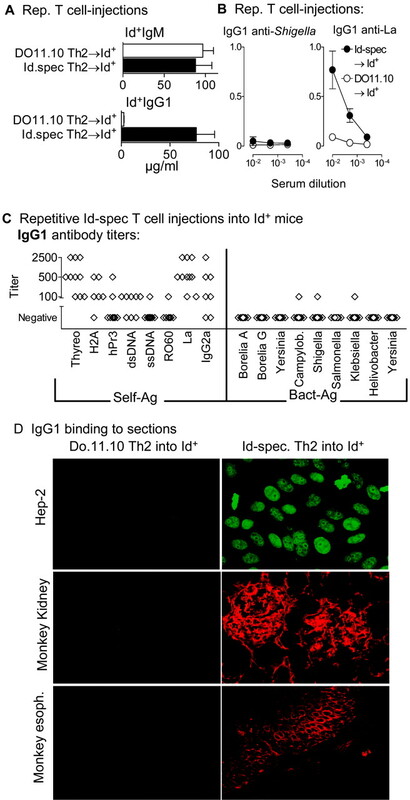 As a T cell specificity control, neither IgG nor IgM were increased in Id+ mice repetitiously injected with DO.11.10 OVA-specific Th2 cells (Fig. 5⇑A and data not shown). Despite such an intensive regimen with a pronounced increase in overall IgG1, hardly any IgG1 antibacterial Abs were found at any time point. In fact, only one of nine mice had low titers of IgG1 antibacterial Abs toward three of seven bacterial lysates (Fig. 5⇑C, right panel). Sera from Id+ (but not Id−) mice injected once with Id-specific T cells had Id+ IgM autoantibodies on days 5 and 13 (Fig. 6⇑, A and B, see Materials and Methods for listing of autoantigens used). No IgG autoantibodies were found. To test whether IgG autoantibodies would eventually develop with time in the continuous presence of Id-specific T cells, sera of repetitiously (four to eight times) Th2-injected Id+ mice were investigated for IgG autoantibodies. Id+ mice receiving Id-specific Th2 cells, but not OVA-specific Th2 cells, developed relatively high titers of Id+ IgG1 autoantibodies against a panel of autoantigens (Figs. 5⇑B, right, ⇑C, left, and data not shown). Moreover, many of the sera had IgG1 autoantibodies detected by indirect immunofluorescence staining of HEp-2 cells (7 of 10 sera were positive for IgG anti-HEp-2 with a cytoplasmic or nuclear staining pattern, Fig. 5⇑D and data not shown) and tissue sections (IgG anti-glomeruli Ab (6 of 10 sera), IgG anti-monkey esophagus (4 of 10 sera), Fig. 5⇑D and data not shown). Similar, but less prominent autoantibody profiles were obtained with repetitive injection of Id-specific Th1 cells (data not shown). As noted above, sera of mice receiving repeated injections of Id-specific Th2 had high levels of Id+ IgG1; however, this general increase in IgG1 cannot explain the detection of IgG1 autoantibodies because 1) the titers of IgG autoantibodies were much higher (500–2500 times) than the increase in IgG1 (40 times) and 2) no IgG1 antibacterial Abs were detected in the same sera (Fig. 5⇑C). Thus, there was a selective increase in IgG autoantibodies. The results describe a novel type of T-B collaboration that is Id driven and nonlinked (Fig. 1⇑). Furthermore, the data support the hypothesis that nonlinked Id-driven T-B collaboration in the absence of BCR ligation results in natural IgM Abs, while BCR ligation by autoantigen results in GC formation and production of IgG autoantibodies. Nonlinked Id-driven T-B collaboration rests on the premise that B cells are potent presenters of endogenous Id. Most investigators agree that activated B cells, which have up-regulated their MHC class II and costimulatory molecules, are potent APC for both naive and memory T cells (27). However, whether naive small resting B cells have an APC function is debated. Some have found naive B cells to be poorly stimulatory for T cells (28, 29, 30, 31) and even to induce T cell tolerance (32). Others have found that B cell activation is dispensable for APC function (33, 34) and that naive T cells can induce CD40-dependent costimulatory ability in resting B cells in vivo (35). These contradictory results may be resolved by experiments which conclude that naive B cells can stimulate high-affinity, but not low affinity, T cells, in vitro as well as in vivo (19, 36). Extending the affinity model (19, 36) to Id presentation by B cells, class II molecules could be so efficiently loaded with Id peptides that a high-avidity interaction with Id-specific T cells is accomplished. Supporting such an idea, Ig-derived peptides have been readily identified among peptides eluted from class II molecules of B cell lymphomas (6, 7, 8, 9). However, similar data do not exist for resting or activated normal B cells and it could be argued that loading of class II molecules, and thus ability to stimulate T cells, might increase with B cell activation (27). There are empirical data which directly address the ability of naive small resting B cells to stimulate Id- specific CD+ T cells. In the λ2315 Id model used herein, previous studies showed that high-density transgenic B cells potently stimulated transgenic Id-specific memory T cells in vitro and that highly purified sorted small resting B cells stimulated Id-specific memory T cells in vivo (3). In another study, high-density Ig-transgenic and normal B cells poorly activated VH and Vκ Id-specific T cell hybridomas in vitro, while activated B cells were efficient presentors (5). These studies (3, 5) agree that activated B cells potently present Id but disagree on the ability of resting B cells to do so. A number of factors could explain the contradictory findings: 1) various Id peptides could differ in their ability to load class II molecules of resting B cells, 2) Id-specific T cells used could differ in affinities, and 3) different T cell readouts were used. Taken together, resting naive Id+ B cells appear to present at least some but not all endogenous Id peptides and stimulate memory Id-specific T cells. In relation to the discussion raised above, it should be noted that initiation of Id-driven T-B interaction in vivo might in fact not depend on efficient Id presentation by naive B cells per se. Naive Id+ B cells could first be activated in a conventional Ag-specific manner (16, 17) (see BCR ligation discussion below), or by bacterial products such as CpG (37, 38, 39). As for T cells, Id-specific T cells may obtain memory status by other means than by stimulation by Id+ B cells, e.g., dendritic cells can be Id primed (40) or TCR specificity may be degenerate (41), i.e., naive T cells specific for exogenous Ag may obtain effector status and only secondarily cross-react with a given B cell Id. Hence, mechanisms have been described which would allow Id-driven interaction in vivo between previously activated B and T cells. Because Id-driven T-B collaboration (Fig. 1⇑) depends on availability of Id-specific T cells, an important question is to what extent do Id-specific CD4+ T cells exist? There is evidence that there is a T cell repertoire for rare Id peptides dependent on somatic mutations or N region diversity (10, 11, 12, 13), although the TCR repertoire for a single rare Id peptide was shown to be limited (42). Given that CD4+ T cells specific for rare Id peptides are not deleted and given that a considerable fraction of individual B cells should express rare Id peptides, one is compelled to ask whether Id-dependent T-B collaboration occurs under physiological circumstances. A crucial question is whether such “Id-paired” B and T cells would ever meet during lymphocyte recirculation. The present results demonstrate that productive interactions can be followed with flow cytometry when paired B and T cells are diluted to ∼1% in host spleens, with collaboration within days. Thus, considering an average life span of an individual, it is quite possible that Id-paired T and B cells with physiological frequencies of 1/104–5 might occasionally encounter. There might be further limits to Id-driven T-B collaboration. Only a fraction of rare Id peptides are expected to fit the peptide-binding motifs of the MHC molecules of the individual, and only such Id peptides are relevant to Id-driven T-B collaboration. Moreover, collaboration between Id+ B cells and Id-specific T cells could be dampened by a number of factors, including regulatory T cells (43). In conclusion, even though the present study clearly demonstrates that Id-driven T-B collaboration occurs in vitro as well as in vivo under reductionistic transgenic conditions, arguments raised above must be taken into account as to the relevance of Id-driven under physiological circumstances. There is, however, evidence that Id peptides derived from lupus autoantibodies stimulate T cells from autoimmune mice (4, 43, 44, 45). In these cases, the underlying mechanism could well be that of Id-driven T-B collaboration resulting in autoantibodies, but this remains to be demonstrated. Nonlinked Id-driven B cell autoimmunity resembles the T cell-driven autoimmune B cell responses observed with presentation of MHC alloantigens (46, 47), viruses (48), superantigens (19, 49), or B cells pulsed with synthetic peptide (50, 51). In these cases, T-B collaboration is nonlinked in the sense that the B and T cell epitopes do not derive from the same Ag. However, superantigens and viruses subside with resolution of infections, alloreactive T-B cooperation only occurs in the settings of pregnancy, blood transfusions, and transplantation, and pulsing with peptide is an artificial experimental situation. By contrast, nonlinked Id-driven B cell collaboration is physiological and should occur throughout life but with important limitations outlined above. We show that under conditions of Id-specific T cell help, provision of a BCR ligand (hapten) to Id+ B cells was required for GC formation and an IgM → IgG switch of anti-hapten Id+ Ab. This result resolves an issue that has been difficult to address in conventional linked T-B collaboration: what events are necessary for the GC reaction and isotypes switching? 1) the binding of Ag to BCR per se or 2) or its consequence, increased Ag presentation to T cells. Because the second event in conventional T-B collaboration is contingent upon the first, it is difficult to decipher their separate influences. The present experiment makes it possible to distinguish between the two: by using B cells that spontaneously present endogenous Id to T cells, we can here demonstrate that BCR ligation is necessary for GC formation and isotype switching. Natural IgM Abs arise by poorly understood mechanisms in the apparent lack of Ag exposure (52) and are important in the first line defense against pathogens (53). We here show that Id+ B cells were triggered by Id-specific T cells to secrete anti-bacterial IgM Abs both in vitro and in vivo, even though the mice should not have been exposed to any of the many exotic bacterial Ags tested. Consistent with this, most Id+ B cells became activated by Id-specific T cells and produced predominately IgM in vitro as well as in vivo. Moreover, hapten-based adoptive transfer experiments demonstrated that NIP-primed Id+ B cells collaborated with Id-specific T cells in the absence of NIP carrier, but only IgM was produced and no switch to IgG was observed. Collectively, these results suggest that in the absence of BCR ligation, Id-driven T-B collaboration results in IgM Abs which are “natural” in the sense that no eliciting Ag is known. Presumably, the diverse specificities of these secreted natural IgM Abs is caused by a polyclonal H chain repertoire pairing with the Id+ L chain in the BCR of Id+ B cells stimulated by Id-specific T cells. Although Id-driven T-B collaboration might contribute to natural Abs, there must also be additional mechanisms since T cell-deficient mice can produce natural Abs albeit of a limited repertoire (54, 55). Autoantibodies of IgG isotype are associated with a variety of autoimmune diseases. The mechanism of autoantibody induction is poorly understood, but may result from the break of T cell tolerance to (modified) self-Ags (56, 57, 58). We here report evidence that BCR ligation, concomitant with nonlinked Id-driven T-B collaboration, elicit production of IgG autoantibodies. Thus, upon prolonged Id-driven T-B interaction, autoantibodies switched from IgM to IgG while Abs toward bacteria remained IgM. This difference may be explained by autoantigens being displayed in tissues as BCR ligands for autoreactive Id+ B cells, while the exotic bacterial Ags screened in this study should not have been available for BCR recognition. Since nonlinked Id-driven T-B collaboration resulted in IgG autoantibodies, it might be hypothesized that Id-driven T-B collaboration may cause autoimmune disease. Indeed, in experimental situations of chronic collaboration between Id-specific T cells and Id+ B cells, mice develop multiorgan autoimmune disease with systemic lupus erythematosus-like features, and disease can be transferred with purified T and B lymphocytes (L. A. Munthe, A. Corthay, and B. Bogen, unpublished data). There is circumstantial evidence for a connection between Id-driven T-B collaboration and autoimmunity: Ig-specific T cells have been suggested to exist in rheumatoid arthritis (59) and systemic lupus erythematosus patients (60, 61), although they were not cloned nor were their fine specificities characterized. Furthermore, Id-specific T cells have been described in autoimmune BWF1 mice (15, 45) as well as in CD95-mutant lpr mice (4). Taken together with the present experiments in a well-defined transgenic system, it seems plausible that nonlinked Id-driven T-B collaboration may represent a mechanism for production of autoantibodies and autoimmune diseases in genetically predisposed individuals. The expert technical help of H. Omholt and P. Hofgaard is appreciated. 1 This work was supported by the Norwegian Research Council, Medinnova SF, Odd Fellow, and the Norwegian Rheumatism Association. ↵3 Abbreviations used in this paper: BCR, B cell receptor; SN, supernatant; LN, lymph node; NIP, 4-hydroxy-3-iodo-5-nitrophenyl acetyl; KLH, keyhole limpet hemocyanin; BrdU, 5-bromo-2′-deoxyuridine; PNA, peanut agglutinin; AECM, aimnoethyl carboxymethyl; TNP, 2,4,6-trinitrophenyl: GC, germinal center; gr., group; int, intermediate; NIP, 4-hydroxy-3-iodo-5-nitrophenylacetyl. Weiss, S., B. Bogen. 1989. B-lymphoma cells process and present their endogenous immunoglobulin to major histocompatibility complex-restricted T cells. Proc. Natl. Acad. Sci. USA 86:282. Weiss, S., B. Bogen. 1991. MHC class II-restricted presentation of intracellular antigen. Cell 64:767. Munthe, L. A., J. A. Kyte, B. Bogen. 1999. Resting small B cells present endogenous immunoglobulin variable-region determinants to idiotope-specific CD4+ T cells in vivo. Eur. J. Immunol. 29:4043. Zhang, X., D. S. Smith, A. Guth, L. J. Wysocki. 2001. A receptor presentation hypothesis for T cell help that recruits autoreactive B cells. J. Immunol. 166:1562. Snyder, C. M., X. Zhang, L. J. Wysocki. 2002. Negligible class II MHC presentation of B cell receptor-derived peptides by high density resting B cells. J. Immunol. 168:3865. Rudensky, A. Y., P. Preston-Hurlburt, B. K. al-Ramadi, J. Rothbard, C. A. J. Janeway. 1992. Truncation variants of peptides isolated from MHC class II molecules suggest sequence motifs. Nature 359:429. Chicz, R. M., R. G. Urban, J. C. Gorga, D. A. Vignali, W. S. Lane, J. L. Strominger. 1993. Specificity and promiscuity among naturally processed peptides bound to HLA-DR alleles. J. Exp. Med. 178:27. Newcomb, J. R., P. Cresswell. 1993. Characterization of endogenous peptides bound to purified HLA-DR molecules and their absence from invariant chain-associated αβ dimers. J. Immunol. 150:499. Lippolis, J. D., F. M. White, J. A. Marto, C. J. Luckey, T. N. Bullock, J. Shabanowitz, D. F. Hunt, V. H. Engelhard. 2002. Analysis of MHC class II antigen processing by quantitation of peptides that constitute nested sets. J. Immunol. 169:5089. Bogen, B., B. Malissen, W. Haas. 1986. Idiotope-specific T cell clones that recognize syngeneic immunoglobulin fragments in the context of class II molecules. Eur. J. Immunol. 16:1373. Bogen, B., T. Jorgensen, K. Hannestad. 1985. T helper cell recognition of idiotopes on λ2 light chains of M315 and T952: evidence for dependence on somatic mutations in the third hypervariable region. Eur. J. Immunol. 15:278. Bogen, B., Z. Dembic, S. Weiss. 1993. Clonal deletion of specific thymocytes by an immunoglobulin idiotype. EMBO J. 12:357. Eyerman, M. C., X. Zhang, L. J. Wysocki. 1996. T cell recognition and tolerance of antibody diversity. J. Immunol. 157:1037. Bogen, B., S. Weiss. 1993. Processing and presentation of idiotypes to MHC-restricted T cells. Int. Rev. Immunol. 10:337. Singh, R. R., B. H. Hahn. 1998. Reciprocal T-B determinant spreading develops spontaneously in murine lupus: implications for pathogenesis. Immunol. Rev. 164:201. Mitchison, N. A.. 1971. The carrier effect in the secondary response to hapten-protein conjugates. II. Cellular cooperation. Eur. J. Immunol. 1:18. Lanzavecchia, A.. 1985. 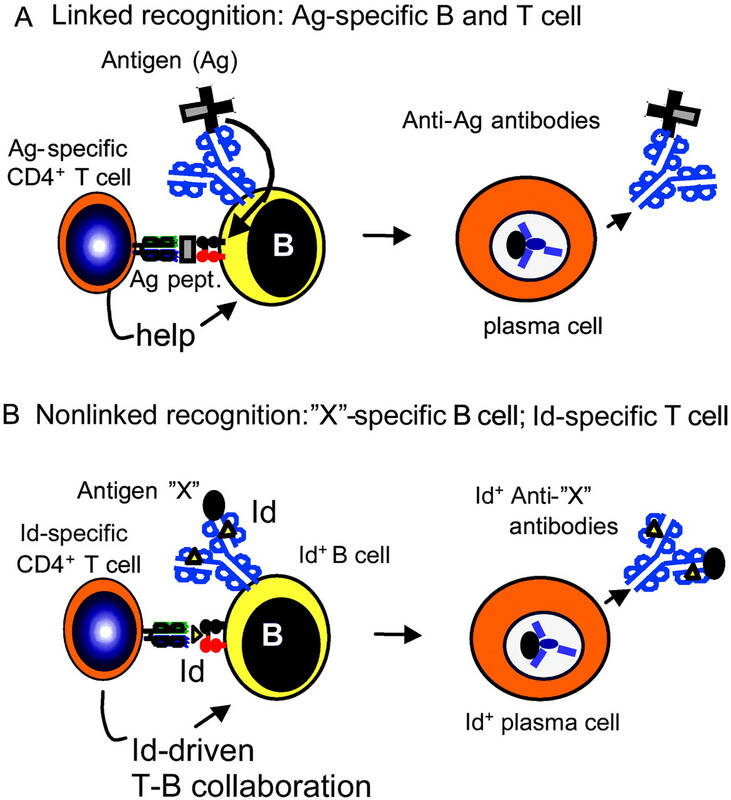 Antigen-specific interaction between T and B cells. Nature 314:537. Cook, M. C., A. Basten, D. S. Fazekas. 1997. Outer periarteriolar lymphoid sheath arrest and subsequent differentiation of both naive and tolerant immunoglobulin transgenic B cells is determined by B cell receptor occupancy. J. Exp. Med. 186:631. Cook, M. C., A. Basten, D. S. Fazekas. 1998. Influence of B cell receptor ligation and TCR affinity on T-B collaboration in vitro. Eur. J. Immunol. 28:4037. Lang, P., J. C. Stolpa, B. A. Freiberg, F. Crawford, J. Kappler, A. Kupfer, J. C. Cambier. 2001. TCR-induced transmembrane signaling by peptide/MHC class II via associated Ig-α/β dimers. Science 291:1537. Lankar, D., H. Vincent-Schneider, V. Briken, T. Yokozeki, G. Raposo, C. Bonnerot. 2002. Dynamics of major histocompatibility complex class II compartments during B cell receptor-mediated cell activation. J. Exp. Med. 195:461. Bogen, B., S. Weiss. 1991. A rearranged λ2 light gene chain retards but does not exclude κ and λ1 expression. Eur. J. Immunol. 21:2391. Bogen, B., L. Gleditsch, S. Weiss, Z. Dembic. 1992. Weak positive selection of transgenic T cell receptor-bearing thymocytes: importance of major histocompatibility complex class II, T cell receptor and CD4 surface molecule densities. Eur. J. Immunol. 22:703. Blichfeldt, E., L. A. Munthe, J. S. Rotnes, B. Bogen. 1996. Dual T cell receptor T cells have a decreased sensitivity to physiological ligands due to reduced density of each T cell receptor. Eur. J. Immunol. 26:2876. Murphy, K. M., A. B. Heimberger, D. Y. Loh. 1990. Induction by antigen of intrathymic apoptosis of CD4+CD8+TCRlow thymocytes in vivo. Science 250:1720. Bogen, B., G. F. Lauritzsen, S. Weiss. 1990. A stimulatory monoclonal antibody detecting T cell receptor diversity among idiotype-specific, major histocompatibility complex-restricted T cell clones. Eur. J. Immunol. 20:2359. Parker, D. C.. 1993. T cell-dependent B cell activation. Annu. Rev. Immunol. 11:331. Lassila, O., O. Vainio, P. Matzinger. 1988. Can B cells turn on virgin T cells?. Nature 334:253. Fuchs, E. J., P. Matzinger. 1992. B cells turn off virgin but not memory T cells. Science 258:1156. Ho, W. Y., M. P. Cooke, C. C. Goodnow, M. M. Davis. 1994. Resting and anergic B cells are defective in CD28-dependent costimulation of naive CD4+ T cells. J. Exp. Med. 179:1539. Croft, M., D. D. Duncan, S. L. Swain. 1992. Response of naive antigen-specific CD4+ T cells in vitro: characteristics and antigen-presenting cell requirements. J. Exp. Med. 176:1431. Eynon, E. E., D. C. Parker. 1992. Small B cells as antigen-presenting cells in the induction of tolerance to soluble protein antigens. J. Exp. Med. 175:131. DeFranco, A. L., J. D. Ashwell, R. H. Schwartz, W. E. Paul. 1984. Polyclonal stimulation of resting B lymphocytes by antigen-specific T lymphocytes. J. Exp. Med. 159:861. Owens, T.. 1988. A noncognate interaction with anti-receptor antibody-activated helper T cells induces small resting murine B cells to proliferate and to secrete antibody. Eur. J. Immunol. 18:395. Evans, D. E., M. W. Munks, J. M. Purkerson, D. C. Parker. 2000. Resting B lymphocytes as APC for naive T lymphocytes: dependence on CD40 ligand/CD40. J. Immunol. 164:688. Fazekas de St, G. B., M. C. Cook, A. L. Smith, M. E. Wikstrom, A. Basten. 1997. Role of dendritic cells in induction of tolerance and immunity in vivo. Adv. Exp. Med. Biol. 417:255. Poltorak, A., X. He, I. Smirnova, M. Y. Liu, C. Van Huffel, X. Du, D. Birdwell, E. Alejos, M. Silva, C. Galanos, et al 1998. Defective LPS signaling in C3H/HeJ and C57BL/10ScCr mice: mutations in Tlr4 gene. Science 282:2085. Krieg, A. M.. 2002. CpG motifs in bacterial DNA and their immune effects. Annu. Rev. Immunol. 20:709. Bernasconi, N. L., E. Traggiai, A. Lanzavecchia. 2002. Maintenance of serological memory by polyclonal activation of human memory B cells. Science 298:2199. Dembic, Z., J. A. Rottingen, J. Dellacasagrande, K. Schenck, B. Bogen. 2001. Phagocytic dendritic cells from myelomas activate tumor-specific T cells at a single cell level. Blood 97:2808. Mason, D.. 1998. A very high level of crossreactivity is an essential feature of the T- cell receptor. Immunol. Today 19:395. Snodgrass, H. R., A. M. Fisher, E. Bruyns, B. Bogen. 1992. Restricted α/β receptor gene usage of idiotype-specific major histocompatibility complex-restricted T cells: selection for CDR3-related sequences. Eur. J. Immunol. 22:2169. Singh, R. R., F. M. Ebling, D. A. Albuquerque, V. Saxena, V. Kumar, E. H. Giannini, T. N. Marion, F. D. Finkelman, B. H. Hahn. 2002. Induction of autoantibody production is limited in nonautoimmune mice. J. Immunol. 169:587. Singh, R. R., B. H. Hahn, B. P. Tsao, F. M. Ebling. 1998. Evidence for multiple mechanisms of polyclonal T cell activation in murine lupus. J. Clin. Invest. 102:1841. Singh, R. R., V. Kumar, F. M. Ebling, S. Southwood, A. Sette, E. E. Sercarz, B. H. Hahn. 1995. T cell determinants from autoantibodies to DNA can upregulate autoimmunity in murine systemic lupus erythematosus. J. Exp. Med. 181:2017.
van Elven, E. H., F. M. van der Veen, A. G. Rolink, P. Issa, T. M. Duin, E. Gleichmann. 1981. Diseases caused by reactions of T lymphocytes to incompatible structures of the major histocompatibility complex. V. High titers of IgG autoantibodies to double-stranded DNA. J. Immunol. 127:2435. Morris, S. C., R. L. Cheek, P. L. Cohen, R. A. Eisenberg. 1990. Autoantibodies in chronic graft versus host result from cognate T-B interactions. J. Exp. Med. 171:503. Hunziker, L., M. Recher, A. J. Macpherson, A. Ciurea, S. Freigang, H. Hengartner, R. M. Zinkernagel. 2003. Hypergammaglobulinemia and autoantibody induction mechanisms in viral infections. Nat. Immunol. 4:343. Mourad, W., P. Scholl, A. Diaz, R. Geha, T. Chatila. 1989. The staphylococcal toxic shock syndrome toxin 1 triggers B cell proliferation and differentiation via major histocompatibility complex- unrestricted cognate T/B cell interaction. J. Exp. Med. 170:2011. Tumang, J. R., D. N. Posnett, B. C. Cole, M. K. Crow, S. M. Friedman. 1990. Helper T cell-dependent human B cell differentiation mediated by a mycoplasmal superantigen bridge. J. Exp. Med. 171:2153. Schiffenbauer, J., J. Soos, H. Johnson. 1998. The possible role of bacterial superantigens in the pathogenesis of autoimmune disorders. Immunol. Today 19:117. Bos, N. A., C. G. Meeuwsen, H. Hooijkaas, R. Benner, B. S. Wostmann, J. R. Pleasants. 1987. Early development of Ig-secreting cells in young of germ-free BALB/c mice fed a chemically defined ultrafiltered diet. Cell. Immunol. 105:235. Ochsenbein, A. F., T. Fehr, C. Lutz, M. Suter, F. Brombacher, H. Hengartner, R. M. Zinkernagel. 1999. Control of early viral and bacterial distribution and disease by natural antibodies. Science 286:2156. Malanchere, E., M. A. Marcos, A. Nobrega, A. Coutinho. 1995. Studies on the T cell dependence of natural IgM and IgG antibody repertoires in adult mice. Eur. J. Immunol. 25:1358. Bachmann, M. F., R. M. Zinkernagel. 1997. Neutralizing antiviral B cell responses. Annu. Rev. Immunol. 15:235. Matsumoto, I., A. Staub, C. Benoist, D. Mathis. 1999. Arthritis provoked by linked T and B cell recognition of a glycolytic enzyme. Science 286:1732. Shlomchik, M. J., J. E. Craft, M. J. Mamula. 2001. From T to B and back again: positive feedback in systemic autoimmune disease. Nat. Rev. Immunol. 1:147. Marrack, P., J. Kappler, B. L. Kotzin. 2001. Autoimmune disease: why and where it occurs. Nat. Med. 7:899.
van Schooten, W. C., D. Devereux, C. H. Ho, J. Quan, B. A. Aguilar, C. J. Rust. 1994. Joint-derived T cells in rheumatoid arthritis react with self- immunoglobulin heavy chains or immunoglobulin-binding proteins that copurify with immunoglobulin. Eur. J. Immunol. 24:93. Williams, W. M., N. A. Staines, S. Muller, D. A. Isenberg. 1995. Human T cell responses to autoantibody variable region peptides. Lupus 4:464. Dayan, M., R. Segal, Z. Sthoeger, A. Waisman, N. Brosh, O. Elkayam, E. Eilat, M. Fridkin, E. Mozes. 2000. Immune response of SLE patients to peptides based on the complementarity determining regions of a pathogenic anti-DNA monoclonal antibody. J. Clin. Immunol. 20:187.